Aiya! 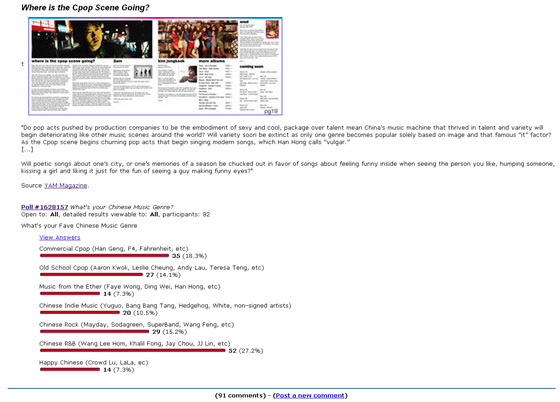 So many comments about the Cpop Scene | personal.amy-wong.com - A Blog by Amy Wong. Check out the LJ discussion here. Woah! I think u started one of the biggest discussions aiya have had in while! Make on in omona, see what happens. Rofl, Kpop are so easily butthurt though! Im not an omona member – frankly, omona and arama are to hostile. I don't like being there. The comments on Aiya were okay until people began picking on Kpop. But at least here, there's people who like Kpop. Liked the survey since it pointed me in the direction of Lala Hsu. I don't listen to a lot of CPop, but I like her a lot.